To improve on the basics, advanced techniques come into play; as you play more games, your game should adapt to take in these new skills. 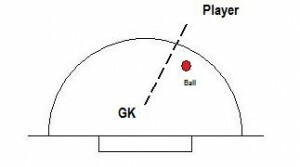 Another article trying to ‘think outside the box’ and consider the goalkeeper’s options for punting away high balls or punting a high ball as an outlet pass. 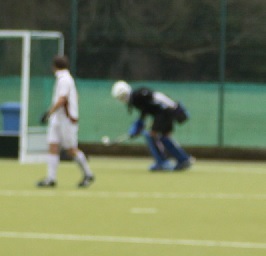 Edit: managed to get some action shots after heading to Guildford to watch a game, where Mason thankfully did so!! 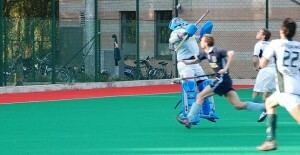 Punt kicks are what are common in football, but whilst a rarity in hockey are seemingly being introduced by some goalkeepers experimenting with the limits of the position. 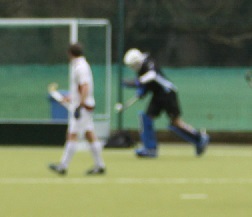 Kind of like the kick to restart play from the goalkeeper’s box in football, but without the ball being on the ground! Essentially kicking to punt away a raised ball, whether from a self pass, or from a high ball. And as I want to point, it has become something that even goalkeepers in our sport of hockey are experimenting with, pushing the limits on what a goalkeeper can or supposedly, can’t do. 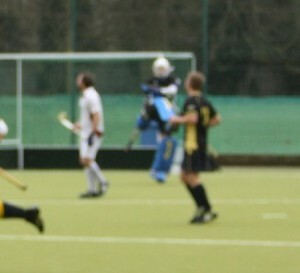 Andrew Isaacs at Havant is the main goalkeeper using the technique in the EHL, but you will sometimes see goalkeepers clearing with the top of the kicker, to aid in getting distance against a raised pass, anyway. It is obviously quite an advanced trick as it only has a rare usage and is pretty difficult (to do well!)! The technique of kicking away with the top of the kicker is essentially just like a drop punt kick in football. 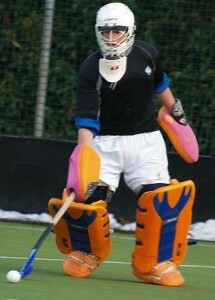 But with a trickier technicality, obviously, as you are wearing foam pads! And except that you can’t use your hands to drop the ball for the kick! 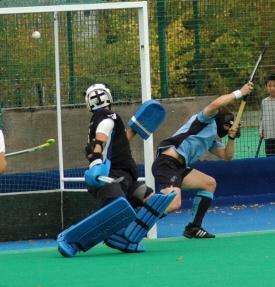 Which makes things harder as you have to flip the ball up with your stick before you punt away (often from the self pass set-up with a defender passing the ball). 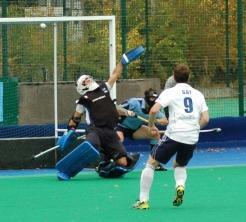 And it also helps to have a variant and learn to kick as a ball comes at you on the drop of an aerial etc. 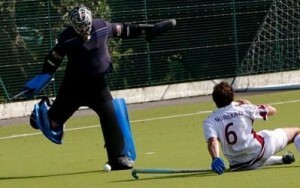 There was a lot of talk when the free hit rule changed and the self pass option became introduced into the hockey world. And some goalkeepers considered making use of it to allow further options to get the ball up the pitch quickly and confuse the opposition team at the same time. 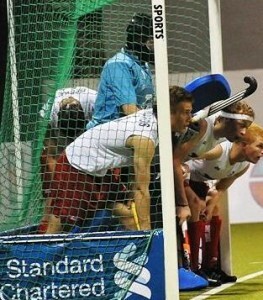 Obviously with aerials being allowed at free hits in hockey, it doesn’t seem quite so unique or needed as the player can release an aerial! It is something that ‘Mace’ (Simon Mason, ex-GB, current first choice at Guildford) when it became something of interest. He was accurate with it and could get it quite far (heard he did a couple of times but seen it done in training; happy to be corrected if wrong!). But this is something that Andrew Isaacs at Havant has started pioneering and test. Doing essentially what Stockmann can be seen doing, but at the restart and with more regularity and trying for greater distance and accuracy. He did it last season, but may not be doing it quite so much this season! And haven’t been able to get to any of their games to check! You can see the process at 0:10 (it, the first, looks to be an assist on a goal scoring opportunity) and then 0:20 and 0:58 and 1:10 (basically all the way throughout the video but pernickety in timing for skipping through!). He seems to kick with the left from the free hit restart, but know he is comfortable with kicking with both feet, seeing him ‘punt’ a flick into the D with his right before. Not sure if 0:58 is an example of him kicking away a loose high ball as he does, as a little out of focus. It’s a big ask in hockey where it’s unexpected and will take a lot to pull it off accurately, making it seem less likely to be used so regularly! Kicking over distance, where you have to predict the drop, is a little different to kicking on the floor. 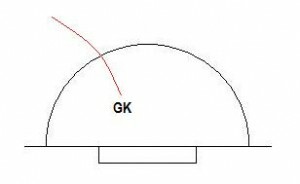 Football goalkeepers at the elite level are judged on their pinpoint accuracy with their kicking and to get an aerial kick to a player without ‘making it dangerous’ requires this even more so, if done in hockey. The following is a great example. Timing, direct and power for distance all come into play. Gazzaniga at Southampton may have only got a few Premier league starts this season, but I was surprised by his ability with distribution. His accuracy is pretty amazing and has gotten a lot of assists for starting scoring opportunities. See at 0:35, for a short but precise pass. Watch for 0:46 and 1:00 for great examples and evidence of this! And the rest are good enough to watch and see. 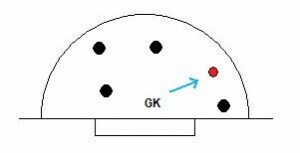 Sidetracking as I often do, but in football, goalkeepers are seen as the extra defender and distributor, which hockey goalkeepers can learn from, if open minded and ‘thinking outside the box’! Joe Hart will often take free kicks outside his area and command distribution, as another example. In football they love it if you set up goals for them and outside the stereotype of goalkeepers accept you more as a team mate, but I can’t see it catching on in football! Other than restarting play, a punt kick also gives further options when dealing with high balls into the D. Of course, if it’s an aerial pass into the D, it’s a pretty difficult to judge and get right. But, with an elite skilled goalkeeper, because reading the game for them is at a high level and more opportunities like this are faced, then it may be of use. If the timing is such that the attacker isn’t going to get their first, but you need to clear because otherwise the ball could run on for them to latch onto, then it is something to consider. Possibly! If dealing with an aerial flicked into the D, swatting at it with the glove won’t actually do much. At least, that’s what I’ve found. Even if you’ve got good rebound properties with your glove, putting it just outside the D requires help from defenders (who may not be there) and such. 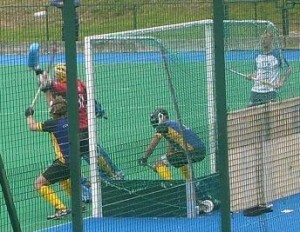 Having witnessed Isaacs do it in person in a friendly against Holcombe, I’ve observed its uses. With a kick away, he managed to get it to distance and well controlled with accuracy, to the sidelines; much further than a clearance with the glove. You can’t really do that with a glove and a kick if done with power, provides another option. Unorthodox, yes and very difficult to teach but it is also very handy. 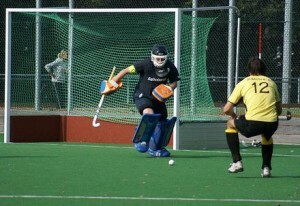 A skill used appropriately in the right situation, which effectively is what the science of goalkeeping technique and tactics is about really. Having ‘tools in your toolbox’ as Mitch Korn teaches in ice hockey and something to be learnt from. In the video of Isaacs, you can see Millington (playing for Exeter) just about (the camera angle blocking him out of shot!) at about 1:15 playing time. Interestingly, Isaacs uses Mercian kickers, which do not have buckles on the ‘face’ which could potentially affect the ability to punt the ball. 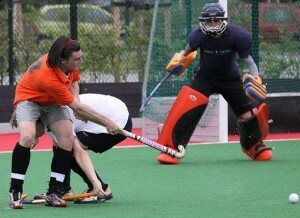 Gryphon, Mazon and Grays also use this strapping system. I’m not sure exactly, to what depth, or how much protruding buckles can affect the punt itself, but having seen Obo users pull it off in training, don’t think it presents much of an issue. 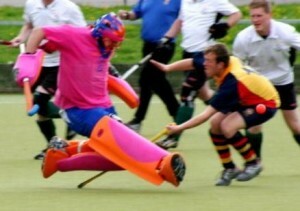 Ultimately, it is an extra option, to confuse the opposition, or to help with a difficult ball that needs clearing. It has a very specific use and takes a lot of working on to be comfortable with, although I do like the idea of goalkeepers in hockey being more comfortable with the ball ‘at their feet’ as in football. You may want to prioritise on more important skills, but if you’ve got everything else sorted, may want to add it to your repertoire (especially if you are at a level where aerials into the D are more common). 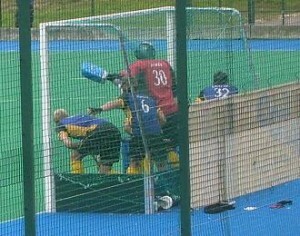 And basically if anything else, it’s a lot of fun to experiment and muck about in training (if you get the chance!) 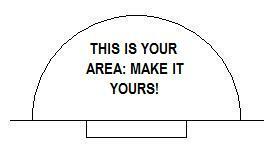 or you can just go down a park or ‘rec’ with a football and have a go, outside of your hockey training schedule. 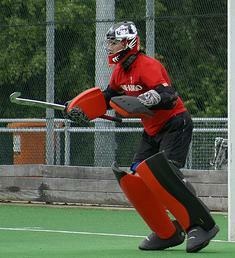 Even if you don’t ever use it in a game, it is practising important skills of goalkeeping. At the fundamentals, it’s working on eye contact, so hand-eye (foot-eye in this case! 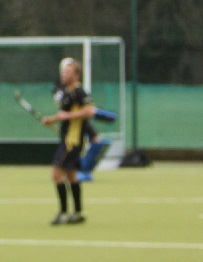 ), tracking the ball with vision, footwork and working with kicking and feeling comfortable with the ball at your feet. And stick work as well as you flip the ball up to punt clear. 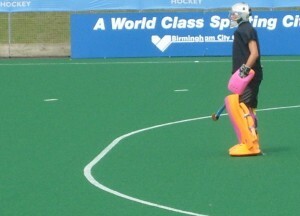 You will see elite goalkeepers using it and you may even consider it yourself (maybe, perhaps!). But it’s a skill in itself and has a lot of finesse and panache I guess as it’s pretty precarious and requires a lot of self confidence and comfortable approach with the skill being pulled off, because otherwise you end up looking like a total Wally, as the ball skips past! It would take a lot of practise and confidence to pull it off in games, but can still be utilised as an option for a strong clearance against a high pass. Or maybe not! But I think it’s good to be seeing goalkeepers push the boundaries and experiment with the goalkeeper as an option as distributor and for clearing. But, it’s not like I’m recommending you go out and teach yourself it to use in games! The article was written as a means to explore and engage with the idea of what a goalkeeper can and should do, as an extra defender perhaps. It’s just a chance to get you to think! 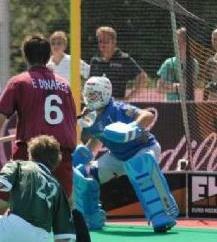 Thinking about the position of goalkeeper and the goalkeeper’s role within the team. 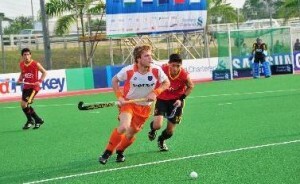 Personally, I would really like to see hockey becoming a lot more like football (hearing the cries of dismay!) 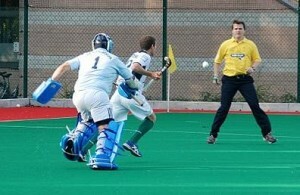 in relation to goalkeeping (not anything else! ), where the goalkeeper is an outlet pass option, accurate and comfortable with the ball at their feet, and ‘the fifth defender’. Ice hockey is no different, where the goaltender is taught to ‘dump the puck’ with a long pass and can even assist on goals, so in terms of this, I think hockey (goalkeeping) is a little behind the times on boundary pushing and someone like Isaacs could have an impact on the way we think about playing in goal and revolutionise the approach to the position and thoughts about it. Just my take on things! Not as if they’re groundbreaking or anything (my opinion that is)!